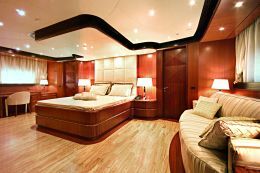 The success of the Fipa brand and its increasing international fame have been based to date on a wide range of motoryachts in GRP, from 20 to 38 metres, whose elegance, technical content and impeccable furnishings have won praise from many experts. With this Maiora 43 - the 43 metres LOA make it the Viareggio yard's flagship - Fipa has entered powerfully into the metal construction segment with a superyacht developed on four decks, with semi- displacement hull in steel and superstructures in aluminium, a vessel capable of holding her own with the keenest and highest class of competition in this specific segment. Range at the speed of 12 knots: 7.000 nautical miles. 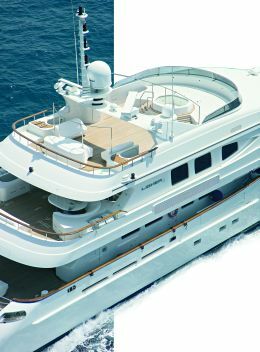 For information: Fipa Italiana Yachts, Via Sarzanese, 55054 Massarosa (LU); tel. +39 584 93353; fax +39 584 93118; or Via Tetrarca 14, 55049 Viareggio (LU); tel. +39 584 388330; fax +39 584 388974; website www.maiora.net; email: info@maiora.net. Tradition projected into the future: this seems to fit like a glove if we think of the Fipa yard's recent 43 metre, a yacht of great content, top of the Maiora range and well representing the very essence of a brand that has always expressed quality. Vessels designed and built with the aid of all possible technological developments, but where the manual skill of the individual craftsman creates an added value that distinguishes each model. With her maximum level of customisation, due first of all to the material employed, the Maiora 43 is put forward in the totally custom-built segment, specifically that of long range cruisers which are also capable of remaining a long time in the roadstead, wholly autonomous even if far from port. To highlight attributes of this kind the vessel has been given a semi-displacement hull, designed using know-how from the merchant vessel sector, in order to achieve performance (16.5 knots maximum and around 15 cruising) and safe, comfortable seakeeping even with a sea running. 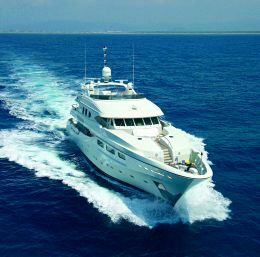 The building standards too are of the highest standards, for an actual ship that may also be used for charter. 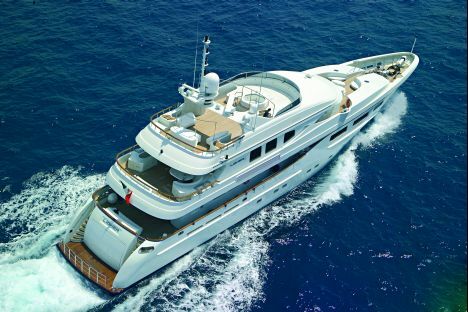 This superyacht has the highest Italian Shipping Register (RINA) classification - Croce di Malta 100 1.1 - as well as corresponding to the complex and severe requirements of the British MCA standards, specific to vessels for which chartering is envisaged. The essence of a great voyaging yacht is rendered even clearer by the fuel and water tanks (80.000 and 13.000 litres respectively), three generators (two 85 kW CAT plus a 33 kW Kohler) and a 700 l/h Tecnicomar watermaker. The design is the work of architect Roberto del Re who has designed other of this Tuscan brand's models. He sought to give this Maiora too the thrusting features that have made the entire range easily distinguishable. Not an easy task however on a vessel with three internal decks plus sundeck, and therefore with generous vertical development. But we would say that he has succeeded, especially in the aft section where the Maiora family feeling is most evident. 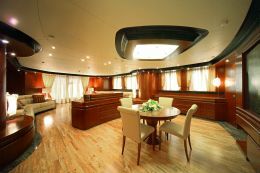 The result is a well proportioned whole - notwithstanding the spacious interiors - with the ship's side featuring not only a great number of ports that give light to the lower deck but also great rectangular glazed areas at main deck height forward, where the designer has placed the owner's area. A wide body type solution has been used in this portion of the deck, which is to say with a full beam deckhouse, and therefore without gangways, precisely to emphasise the dimensioning of the owner's quarters. Great emphasis has also been given to the external spaces for comfortable living en plein air. This is abundantly visible in the cockpit, with its large living area and an similarly large oval dining table with chairs. The upper deck, with the external part aft partially covered and protected by the sundeck structure, is furnished with a very welcoming semicircular dinette. But especially the topmost deck which is equipped with really everything you need to enjoy a day of sunshine. A mini swimming pool with Jacuzzi, chaises longues, sun-beds and an outdoor dining area served by cooking facilities with barbeque. Then there is a conversation area and a spacious bathroom with shower, on the port side next to the roll-bar upright. As for the interiors, as we said, the great volumes of the yacht are exploited to the full: airy and spacious environments which are moreover impeccably furnished. Typical of these is the main saloon, the first room you come to entering from the cockpit. There are three big leather sofas - one at each side and a central one placed athwartship - which create a living area that is highly convivial and well integrated with the dining room farther forward. The two spaces are so to speak separated by a wooden item of furniture that contains a large plasma TV, fully retractable. In the dining area there is a large circular table with eight chairs, and then another two sofas at the sides. 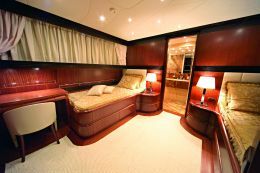 There is a lot of wood: the flooring is in light coloured olive, laid "ship's deck" fashion, while the walls and furniture are in darker wood - mahogany - with ebony finishes. There are also fine panels at the bottom of the room, worked to produce a prism effect, which conceal the access doors to the forward zone. 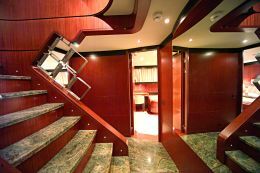 Opening the one on the left, next to a pantry also accessible from the external gangway by way of a massive watertight door, we find the galley, a vast area fully equipped for long cruises: super-sized storage space, fridges and icemakers. A highly technical environment but also fine to look at, where the light wood of the furnishings is contrasted by the black of the granite which has been extensively used here, the whole brightened by the steel of the sink and the appliances. A stairway leads from the galley to the crew's quarters: four double cabins, all with bathroom; a dinette, a second service galley and a laundry that could be defined as professional. This is a solution that makes crew activities totally independent from owner and guests, thus ensuring an optimal level of privacy. 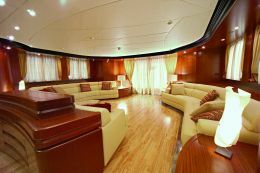 From the saloon, opening the door on the right, you come to a lobby which is outstanding for its flooring in forest green marble and from which the daytime toilet, in quartzite, is accessed as well as the lower deck by way of a stairway which leads to a landing onto which the guest night areas give. The four cabins in this forward part of the lower deck - two with double beds and two with twin beds plus a foldaway - all have private bathroom with spacious shower. 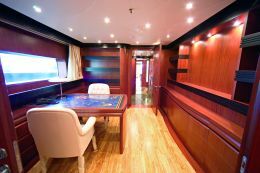 Going back to the main deck and proceeding along the starboard side we come to the owner's area: first a study and then the owner's suite. 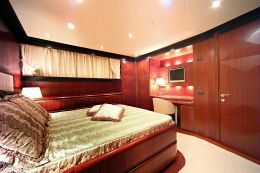 Over and above a large double bed this features a sofa on the starboard side, a dressing table on the opposite side, a walk-in wardrobe and a really spacious bathroom where there are double washbasins and toilets, shower and Jacuzzi. The upper deck, in the area facing aft, consists of a great panoramic dining room with two sofas and an extendable oval table that can seat 18. In the centre of this deck there is another pantry, linked by a dumb waiter to the one below, and a second daytime bathroom on the port side. The captain's cabin is on the starboard side, with a double bed athwartship, private bathroom and a large shower area. The bridge, farther forward, is a spacious zone with the helmsman's station decentralised to starboard and the co-helmsman's station on the opposite side. Behind them, a semicircular sofa for guests who want to observe the steering of the ship. Externally, still forward, the deck has a fairly secluded open air conversation area from which a stairway leads down to the forward mooring zone. The spacious hangar aft houses two tenders, one of 5.7 metres and the other of 4.8 metres, and is directly connected to the engine room which contains two Caterpillars for an overall 2.600 HP.